Preliminary EPA testing at an independent laboratory yielded very good results. Final test results should be available before the Alliance for Green Heat Decathalon in November. from the back of the stove toward the front, with outlets easily visible from the front viewing window. The display of secondary combustion is always visible, and there is an almost infinite variety of secondary pyrotechnics in the top of the firebox depending on the burn rate, amount of fuel, and damper settings. Active secondary combustion is an important part of both the enjoyment and understanding of burning wood. Secondary combustion is mesmerizing and it also cues the operator/owner to understanding the amount of combustible material in wood smoke that would have otherwise gone up the chimney, resulting in increased pollution and decreased efficiency. 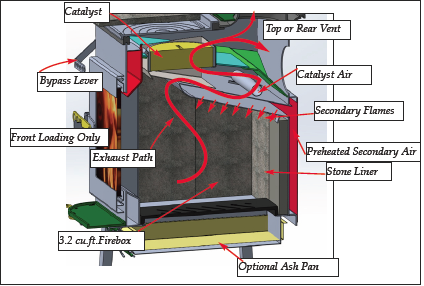 The catalytic combustor points at the top and front of the stove (as opposed to the flue exit), where a customer gets the most benefit from the heat it produces. Imagine that the heat emanating from the combustor spreads at about a 30 degree angle (like a flashlight beam). We capture as much of that heat as we can in the stove top and the stove body, rather than having it go up the chimney. The firebox is large (approximately 3.2 cubic feet), and easy to load through the large front door. It is lined with 1.125” thick soapstone on the side walls, and firebrick on the bottom. The center section of the base has an ash grate if an optional ash pan is ordered with the stove. will this stove be able to cut off the secondaries and do a low output cat only burn? How long of a burn are you looking at? Primary and secondary air are linked, and operated with a single control. The PH uses a rotating control; this stove uses a sliding damper. You cannot cut off the secondary air, but secondary activity at low burn settings is minimal (partly because secondary flow is reduced, and partly because firebox temperatures are low). Overnight burns in the 8-12 hour range will be very easy to achieve, and on general principle we will probably never advertise anything that exceeds that range. For reference, our preliminary EPA testing had a low burn of 11 hours with just 22 pounds of Douglas Fir (and emissions of 0.52 g/hr and efficiency of 84%). Employees burning prototypes in their homes last winter had no complaints about overnight burn times, and we would have heard about it if they did! Any word on whether this stove will have electronic controls, or manual? If electronic will they run off current generated from the heat of the stove, or require outside power? All of the controls on this stove are manual – nothing electronic, and no power required. At one point we thought that we would need at least a small amount of power to achieve the emissions/efficiency profile we were after, but we’re there without adding any power. Having said that, we are working on a “proof of concept” module that does need power. It doesn’t control the stove, but it gives real-time information on the performance of the stove (burn rate, BTU output, efficiency, emissions, time remaining to reload, effects of moisture content, etc.) We think/hope it will be ready to exhibit in November, but again it does not control the stove (though we would hope it might help to control the operator!). The device needs some power for the O2 sensor heater, an amplifier for strain gages, and a small pump. The “proof of concept” module is a combination of known technologies (thermocouples, O2/CO sensors and strain gages) with some software and a GUI (graphic user interphase). I think our big contribution is getting a platform in the base of the stove that impinges on strain gages below the stove so that you can monitor the weight of the fuel load. When you put wood in the stove, you would know its weight, and you would be able to plot its consumption in pounds, BTU output, efficiency, and emissions both for an individual run and over time (weeks, months, or heating season). Tom - will this be an ember protection install or will the hearth require an R value? If so, what are the requirements. The new stove will require thermal protection, and the R value of the hearth pad will be determined when the stove is UL safety tested. Looking forward to real world testing and reviews! I assume you mean Steel stove and not Steal stove or I might take you up on that lol..
how about a water jacket option to assist with radient heat? What are the dimensions of this Union steal stove and particularly the height of its rear flue? Please keep the Union name in honor of US veterans who have lost and suffered so much and those who continue to serve. thank you. Any chance you may incorporate some of these new technologies into your older stoves, future mods? The new stove will have a top or rear vent option, you will choose which works best for your installation.